Arachidonic acid (AA) is an extremely important fatty acid involved in cell regulation. 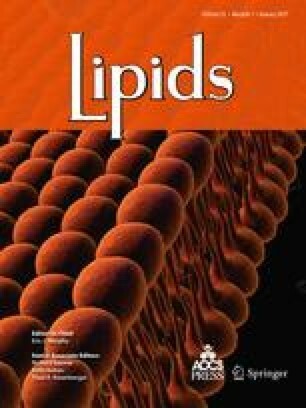 When provided in the diet, it is cogently incorporated in membrane phospholipids and enhances eicosanoid biosynthesis in vivo and in vitro; however, controversy exists as to the levels of AA in food and in the diet. This study determined the amount of AA in cooked and raw portions of beef (rib eye), chicken (breast and thigh), eggs, pork (loin), turkey (breast), and tuna; it compared these results to values published in Agriculture Handbook No. 8 (HB-8). The cooked portions were prepared as described in HB-8. With the exception of chicken thigh and tuna, the levels of AA (w/w) in the selected foods analyzed were significantly higher, in general, than those values published in HB-8. The greatest differences were observed in beef (raw and cooked), turkey breast (raw and cooked), and pork (cooked) where AA levels were twice that of the values in HB-8. In contrast, the AA and n-3 fatty acid contents in tuna were almost half the HB-8 values. The present data indicate that HB-8 tends to underreport the amounts of AA in a number of foods commonly consumed in the American diet, and new initiatives should be considered to validate and update the current database for fatty acid composition of foods.